The different types of debug header connectors are shown here, as well as information on connecting development tools to the header. Debug headers with 8-pin SIL (Single In-Line) connectors are compatible with the tools listed below. The 6-pin socket of the PICkit 3 may be connected to the 8 header pins by removing the two DAT and CLK pins. However, this may compromise future use of these pins/functions with other tools. The 6-pin modular cable attached to the MPLAB ICD 3 may be connected to the 8 header pins through the Modular-to-SIL Adapter. The 6-pin modular cable attached to the Standard Driver Board may be connected to the 8 header pins through the Modular-to-SIL Adapter. No SPI trace is available with this connection because of the loss of the DAT and CLK pins. 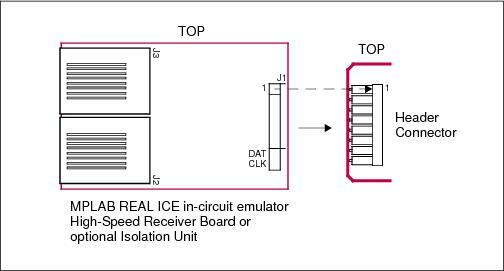 The 8-pin socket of the High Speed Driver Board or optional Isolation Unit may be directly connected to the 8 header pins. Be sure to line up pin 1 on the board with pin 1 on the header. Debug headers with 6-pin SIL (Single In-Line) connectors are compatible with the tools listed below. The 6-pin socket of the PICkit 3 may be directly connected to the 6 header pins. Be sure to line up pin 1 on PICkit with pin 1 on header. The 6-pin modular cable attached to the MPLAB ICD 3 may be connected to the 6 header pins through the Modular-to-SIL Adapter. The 6-pin modular cable attached to the Standard Driver Board may be connected to the 6 header pins through the Modular-to-SIL Adapter. No SPI trace is available with this connection because of the loss of the DAT and CLK pins. The 8-pin socket of the High Speed Driver Board or optional Isolation Unit may be directly connected to the 6 header pins. Be sure to line up pin 1 on the board with pin 1 on the header. Note: No SPI trace is possible in this case because of the loss of DAT and CLK pins. However, if the device supports SPI, two additional header pins can be attached to add this functionality. 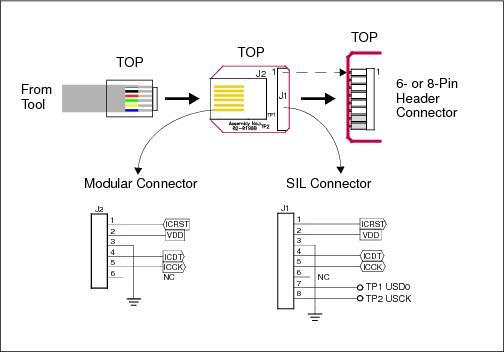 Debug headers with 6- and 8-pin SIL connectors have an additional unpopulated connector available for customer use. This connector has the same pinout as the SIL connector. Solder wires to access individual pins or attach an entire vertical connector. You can use this adapter for a 6-pin modular connector to an 6-pin SIL connector. 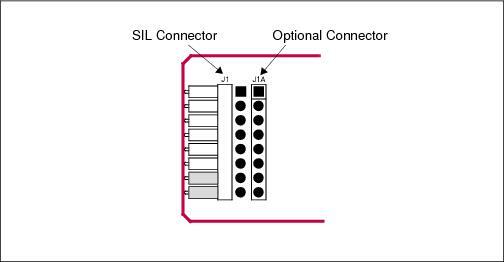 Ensure that you line up pin 1 of J1 with pin 1 of the 6-pin header connector. To order the development tools and other hardware shown here, please refer to the table below.